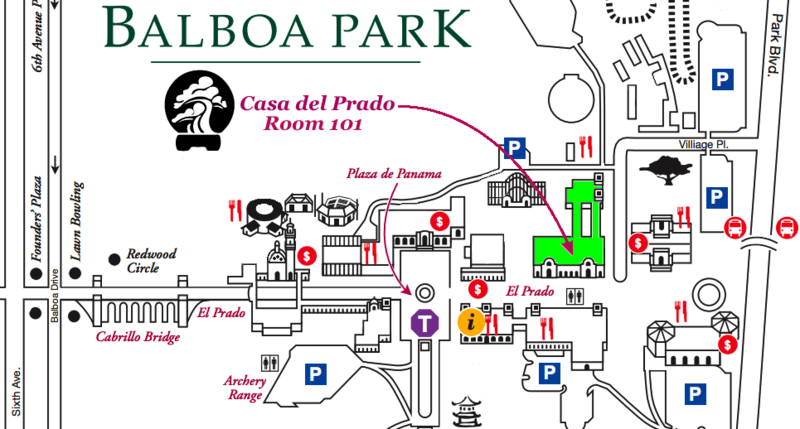 Meetings are generally held at the Casa del Prado building in Balboa Park on the second Sunday of each month at 10:30AM except May and October. In May, the club members meet at the San Diego Safari Park for a program and picnic. In October, members meet for another picnic and fundraiser auction. All meetings are kept brief so the club members can participate in the many varied programs on each month's calendar. Demonstrations by visiting bonsai master, lectures, critiques, and workshops cover subjects of styling of trees, potting, transplanting, wiring, fertilizing, soils, insect control, and water management. SDBC also maintains a monthly sales table at the meetings for convenience of the members with books, tools, and related bonsai accessories.